Ask Leo! #655 – Someone’s Sending from My Email Address! How Do I Stop Them?! People are telling me I've sent them email I know I haven't. Supposedly it's spam, and that's not something I do. Has my account been hacked? How do I stop it? While possible, it's highly unlikely that your account has been hacked. Something significantly more benign is more common. Sadly, it's something you can do almost nothing about. There are a couple of variations, so before we begin, let me also mention some articles that might more closely match your situation. If email is being sent to your contacts without your having done so, and you find messages in your "Sent Mail" folder that you did not send, your email account has most likely been hacked or compromised. See Someone's sending email that looks like it's from me to my contacts, what can I do? If you're getting email that appears to be "From:" your name or a name you recognize, but showing as "From:" the wrong email address, read this: Why am I getting email from someone with the wrong email address? Finally, if people you don't know are getting email "From:" you — the most common scenario of all — there's probably nothing wrong. Keep reading. You're minding your own business, and one day you get a message from someone you've never heard of, asking you to stop sending them email. Worse, they're angry about it. Or worse yet, they accuse you of trying to send them malware! But you don't know them, you've never heard of them, and you know you've never sent them email. Welcome to the world of email malware, where you can get blamed for someone else's infection. And there's worse news to come. Account hacks, while they happen, are not the most common cause for the situation that I've described; spammers are. What's worse? There's almost nothing that you can do. Spammers forge the "From:" address for the email they send. This technique is referred to as "from spoofing". They use all this information to create and send email messages with your name and email address in the "From:" line — email you never sent. Let's use a concrete example. Peter's address book includes entries for his friends, Paul and Mary. Paul and Mary have never met, have never exchanged email, and do not know each other; they each just know Peter. Peter's machine becomes infected with malware of some sort, which collects information from his address book. The virus on Peter's machine sends email with the virus to Paul, looking like it came from Mary. Paul may wonder who the heck this Mary person is and why she's sending him a virus, but she was never involved. From Mary's perspective, you can see how frustrating it would be to be accused of something you had nothing to do with and have no control over. Spammers have also been known to use other sources of email addresses, including database breaches, harvesting email addresses from public webpages, of even purchasing lists of email addresses from one another. All means that the simple "friend of a friend" example I used with Peter, Paul, and Mary is just the tip of the iceberg. It's certainly not the only way your email address could show up on a forged "From" line. What's important is simply this: one way or another, spam messages lie about who the sender is. Related Links & Comments: Someone's Sending from My Email Address! How Do I Stop Them?! I use and recommend using a UPS (Uninterruptible Power Supply) in any case where your power has been known to "glitch", or even shut off completely without warning. Both happen here -- rarely -- but often enough to warrant protection. In addition to serving as a surge protector (the opposite case -- where a sudden spike in voltage damages equipment) devices plugged into the "battery" side of my CyberPower will keep running even when main power goes away. How long depends on how much power you use, and how big a UPS you purchased, its generally more than enough time to save your work and cleanly shut down, even automatically, if so desired. A UPS can avoid equipment damage, and heart-breaking unexpected data loss. 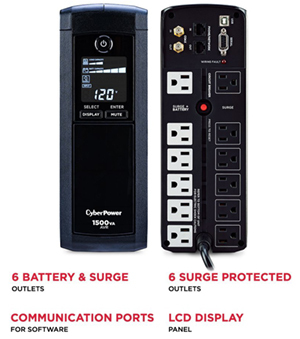 I've had a few over the years, and have settled on the CyberPower models as reliable and cost effective. I even have two, since I have equipment in a couple of places in my home. Check out the CyberPower UPS. I emailed a colleague and within minutes got this email in response that said something like "please visit this link to confirm your identity in order for your mail to be delivered". What's that all about? Is it safe? Could it be spam, or phishing, or something else bad? Welcome to spam wars. Today's episode: "Revenge of the spammed". What you're probably seeing is something called challenge/response. It's a popular way for folks to control the amount of spam they get. A lot of people love it. But a lot of people — people like you and me, who aren't spammers — absolutely hate it. Continue Reading: What's This Confirmation Request I Got When I Emailed Someone? In the past, asking if your machine could become infected with malware by just reading your email would get laughs from the geeks in the crowd. "Of course not!" they would giggle. Then came Outlook. Not only could opening an email infect your machine, but for a while, you didn't even have to be around to have it happen. Continue Reading: Can I Really Get Malware by Just Looking at Email? « Previous post: Ask Leo! #654 – What’s a “Zero-Day” Attack?